I’ve seen several posts on social media lately from Torah keeping women who are looking for more resources for teaching the Bible to their kids, so I want to dedicate this post to tell you about a friend of mine who can help you! I’ve actually been wanting to tell you about her for a long time, but her company was redesigning the website, which is now complete and makes shopping easier. You should know this post does contain affiliate links, but I only recommend resources I love, and this is no exception! Click here to visit her website. Use coupon code TSisters17 to get 10% off any regularly priced item. Expires August 4, 2017. Dianna Wiebe created Grapevine Studies so that moms and children’s teachers would have an easy way to teach kids Bible facts from Genesis to Revelation. As you’ll see, her studies are very hands on for the kids-they draw while they learn! She uses cute stick figures so that anyone can teach using the method. And the best part is that her studies are solid and Biblical. Dianna has a passion for leading children to the Gospel and has been using her studies to equip moms and teachers for this purpose for many years. Her story is much like many of ours-she is a Christian who sees that the Sabbath and Feasts are still very important to the Father and that He desires His children to keep them. Her best selling products are about the Feasts! The Biblical Feasts study is also one of her top sellers. It walks children through the Sabbath first, then the Biblical Feasts from Passover to Sukkot. It is presented in a very factual manner, focusing on Scripture only, and leaves much room for the teacher to add in whatever she wants. I’d also like to add that she even has a study on the Maccabees! How great is that?! Click here to learn more about the Maccabee study. The studies teach the facts, YOU add the doctrine. When you surf her website, you will notice she uses the names “Jesus” and “God” and such. Please remember she has been selling to mainstream Christians for years and she sells to many many denominations, in fact! Her focus is to teach the facts, and let the parent/teacher teach the doctrine. I appreciate this very much! When I use her study with my kids, we just change the names how we want, and I insert my own interpretation when appropriate. But I LOVE her studies for teaching my kids facts and timelines without any doctrine mixed in! Drawing keeps their minds engaged. 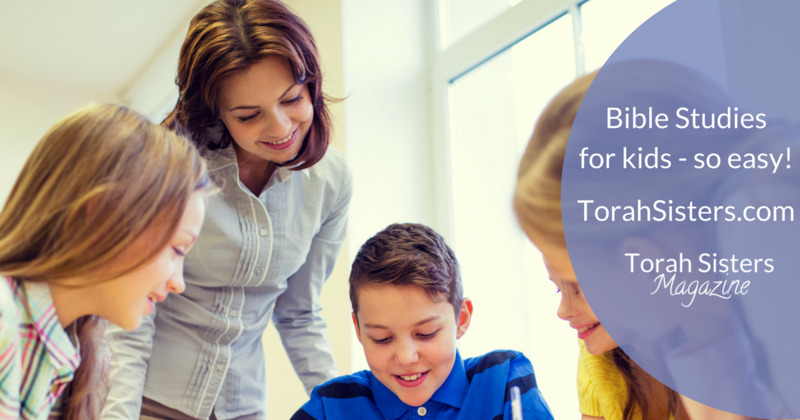 The way the studies work is that the teacher/mom uses the teacher guide and reads the lesson. Everything you say is written down for you. Of course, you can change it however you want. The kids each have a student book where they follow along, has key verses, and room to draw. The mom’s book shows her what to draw as she teaches, and the kids copy while they listen. Drawing keeps their hands busy, which engages their minds. All ages do the study together. If you have kids of different ages, you’ll love her system. If you want to teach little kids and big kids together, get the “Master Teacher Book,” and then get a student workbook for each age you need. All of you will sit at the table together and learn the same lesson together. The little kids have an easier workbook, and the big kids will do more complex drawing and study during the lesson. The littles can sit and learn while the bigs look up words and such. I use her studies in my own home in this exact way. Big kids dig in deep! What you will love even more is that these studies really engage the older kids. They are prompted to look up meanings of words, memorize history timelines, memorize verses, answer multiple review questions, use Bible dictionaries and concordances, and more! If you’re a mom who is overwhelmed about teaching your kids how to know, love and study Scripture in a way that points them to the Gospel, I would highly recommend Grapevine Studies. If you’re unsure where to start, I recommend the Old Testament Overview study first. It will last you a long while. When you’re done with it, move on through the Bible with the next study. It should take you months and months and months to get through them all. Take your time. Her studies will prompt discussion with your kids, and that’s the best part! And along with the Old Testament Survey, I recommend you buy the timeline that goes with it. It’s beautifully printed on heavy card stock, and can be stuck on the wall in your home to keep what the kids are learning in front of them all day. Perfect for families, homeschool and groups on Sabbath. 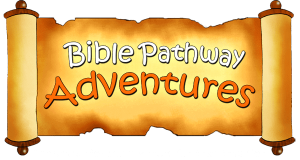 The studies are great for homeschool, family devotions, or children’s programming on Sabbath at your congregation. 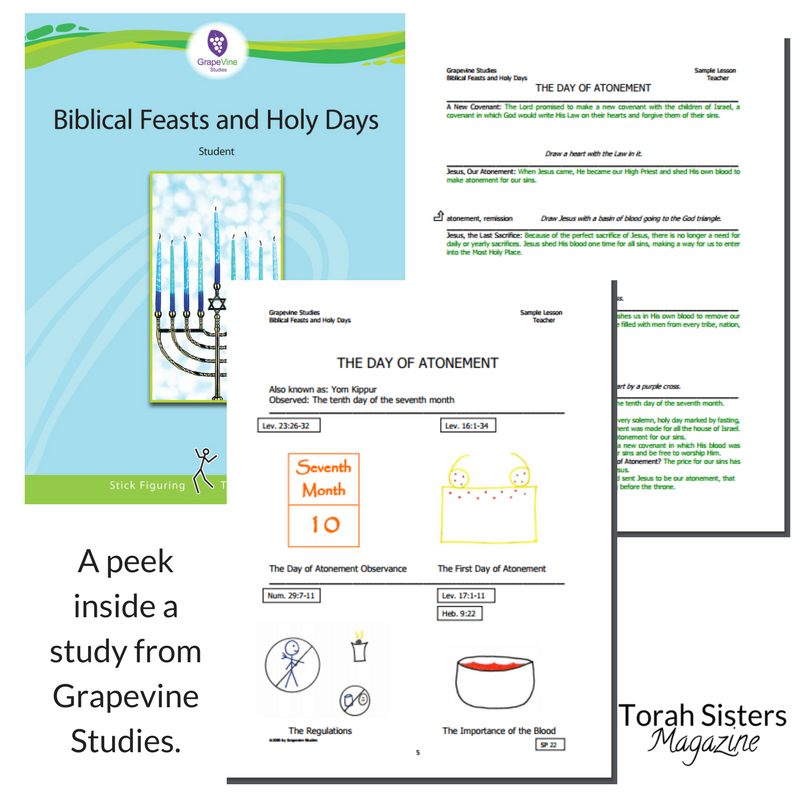 You could also use one of the shorter topical studies for a group during a special week like Sukkot if you need something for children’s programming. Easy to prepare. It’s all done for you. For kids preschool to middle school. Points to Yeshua and the Gospel in every study. The author sells to many denominations but she has a heart for the Torah, Sabbath and the Feasts. These studies can keep your family busy for years. 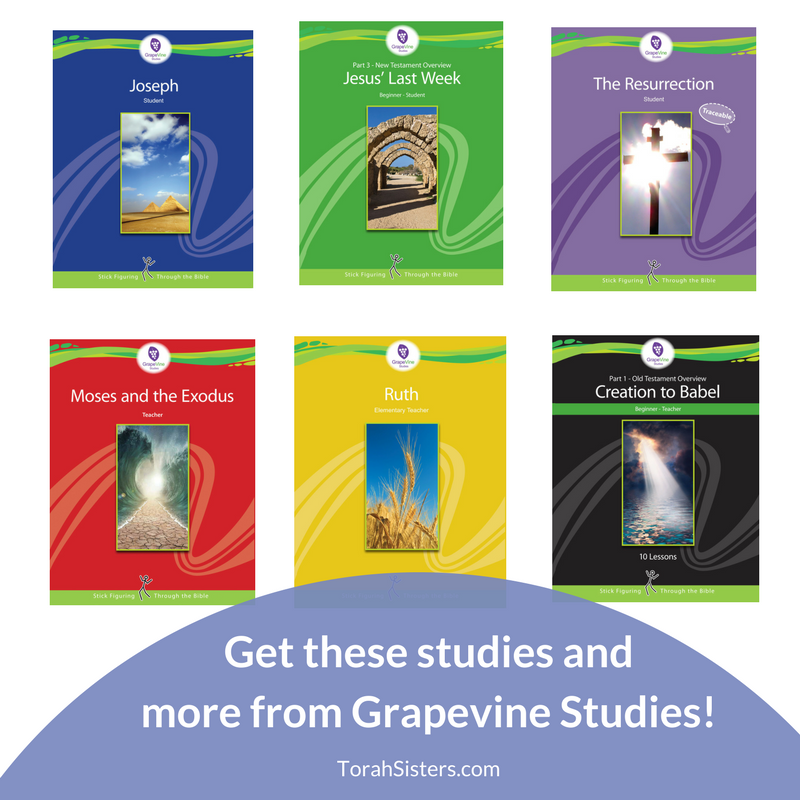 Click here to learn more about Grapevine Studies. Use coupon code TSisters17 to get 10% off any regularly priced item. Expires August 4, 2017.